We know this is true ~ who you hang around with shapes you. The right people in your life with the right words at the right time can make the right kind of difference. Good company is different to hanging out your ‘friends’ after work for a drink. These are the friendships which go beneath the surface. More than a like on social media, these are the ones who show up when you really need them. Good company is people who encourage, support, pray for and speak life over you. It is the ones who come alongside through the toughness, not necessarily to try and fix you but to simply sit in silence with you. It is the ones who don’t mock your grand ideas. Or let you get away with not chasing after those same ideas. Good company is saying more than ‘do what you feel’ or nothing at all. It is bringing words of comfort and a good old fashioned shove when you need it too. This kind of good company can take a lifetime to flourish. This kind of good company is not broken easily. Fox-hole friendships. Grown through experience and season. Good company may only be one or two and to be honest, when the good company is like this, then one or two are more than enough. Find them. Appreciate them. 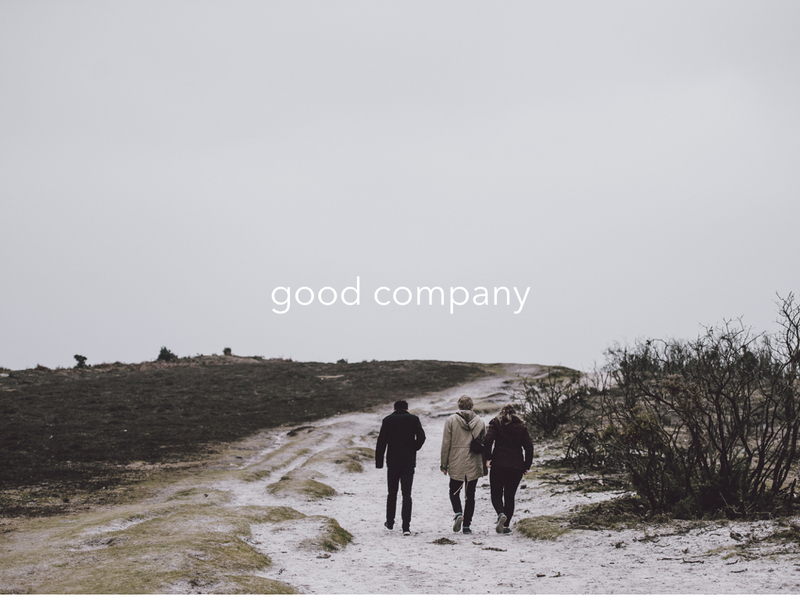 Who is your good company? With no good company the alternative is bad. This kind of company can say the same kind of words but with different motives, which leads to very different kinds of outcomes. This kind of company isn’t thinking of you, it is thinking about itself. Bad company corrupts, leads astray, doesn’t pray. It is well-meaning, yet not life-giving. It is surface friendship. Not encouraging, supportive or God-focused. A well-meaning ‘whatever’, may be meant as support to your grand ideas but it isn’t really. This kind of company are unreliable, not inconvenienced and unprepared to sit alongside. This is not a fox-hole friend, more like a ‘pity-party’ companion. It is those who love to talk about themselves, so they are encouraged. Bad company may only be one or two, and to be honest, when the bad company is like this, then one or two are more than enough. Beware. Who are your bad company? People are important. This is not an instruction to get rid of all your friends. This is more a reminder about the value of great friends and knowing the difference. We can have lots of good people in our world and that’s alright. This doesn’t mean every word they share has to be acted upon. Find the better friends for the life-changing conversations. Those who share the same values for living as you, the same faith as you and the same God at the centre of all that they do.